There's something potentially brewing in Canby that could be quite tasty. During last week's ceremony for the Dahlia Apartments, there was something interesting going on around the corner in the old Canby Police building. Standing in the doorway was Matt Morrissey, who along with partner Colin Moore, plans to open Modest City Brewing in 2019. Morrissey had floor plans and architect's renderings on hand to show those who stopped by to help them catch the vision he and Moore have moving forward for the space. "When we first started looking into this as a project about four months ago, we got some historical documents sent to us about the old city hall building," said Morrissey. "We couldn't find much about the old police building, but when combing through the stuff, there was a little blurb about the city hall being put up in 1937. It was hailed as sort of a prototype modest city hall for the country. 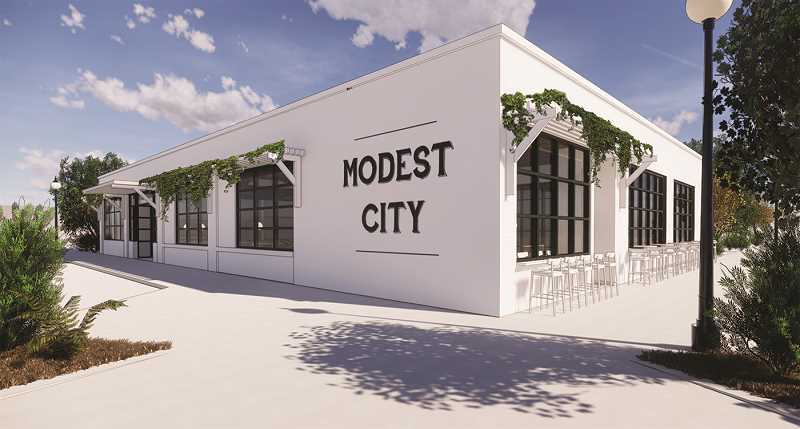 That's been our working title ever since – Modest City Hall Brewing." If all goes well and the final pieces of the financial puzzle can be put in place, the pair hope to have the brewery up and running by spring 2019. Morrissey thinks the potential of the building tremendous. "When I saw those old Doug Fir beams in the roof structure, it really spoke to us," said Morrissey. "The size is perfect to execute a brewery and also have a restaurant that is the right size to be successful without having to have an immediate distribution footprint. We can make that space profitable and take our time growing the distribution end of it." And what will Modest City Brewing offer? Morrissey said there would 8-10 site-brewed offerings at any one time, and mentioned "a killer Pilsner and several IPAs. Then, we're going to work on rounding out some recipes we have, we'll rotate some seasonal items. We understand the need to have a good variety/selection, but we don't want too many that they are sitting there getting old." Both partners have more of a kitchen background and Morrissey said they'll be looking to source local veggies and proteins for a menu that will be varied and is still to be determined. Even with that background, Morrissey said he and his partner are "not strangers to fermented things. I think we have a very educated palate and are very knowledgeable." In addition, the pair will be bringing on Dave Fleming, who has helped open 14 breweries around the west and is currently working with Mt. Angel Abbey on a brewery they are establishing. He'll help get Modest City Brewing up and running and then they'll look for someone permanent to handle the job. And hopefully that will be by next spring. "We are excited about this," said Morrissey.